A geometric quilt pattern reproduced with flowers. Quilt garden next to a building. Ornamental peppers provided color in this quilt garden. This large quilt pattern mural dresses up this otherwise plain wall. Quilt makers will recognize the quilt patterns. The Quilt Gardens are open to the public now until October 1 and are free of charge. For downloadable maps and guides visit their website. I promised to update you on how my lettuce did through the winter. Things were going quite well, I was harvesting lettuce after the first round of the Arctic Vortex. Even after the second round of the vortex, most of the plants were doing well. This was mainly due to the secondary, inner plastic covering I added as the temperatures got colder. Later, I started using bubble wrap insulation at night to try to keep the plants from freezing, it worked pretty well too — for a while. I picked plenty of lettuce even after the second round of the Arctic Vortex. The blue material is plastic bubble wrap. Eventually, the protracted, record-breaking cold did them in. During any other winter I’m convinced I’d still be harvesting lettuce. Now it’s time to look forward to planting early spring lettuce in there. In my last blog posting I wrote about building a hoop house out of reclaimed shade canopy parts. After covering the structure I amended the soil with composted chicken manure. 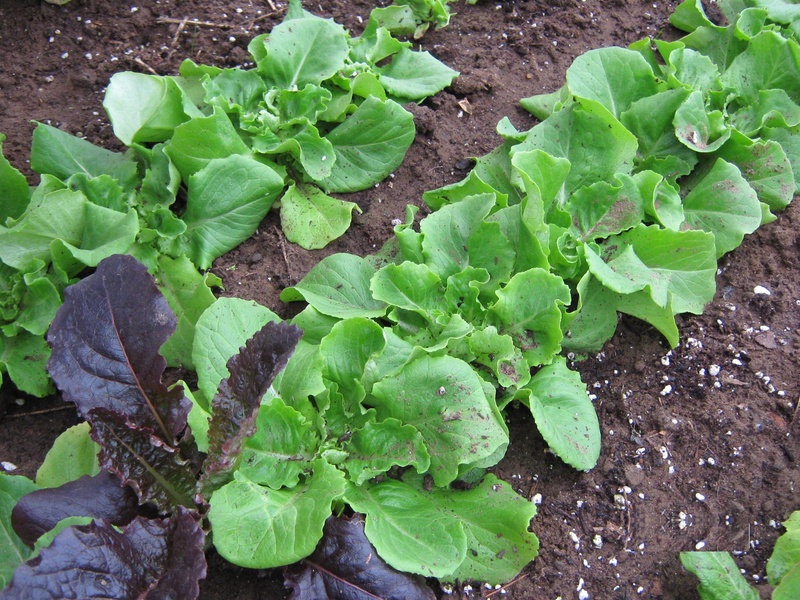 Once the soil was improved, I planted a few short rows of lettuce seedlings. And they made good growth early on. Not only did this crop of lettuce survive the single digit overnight temperatures back in December, it actually looked even more robust. It didn’t however make a whole lot of new growth after that. Because the days are so much shorter during the winter, we can’t expect lettuce to grow like a spring crop outside in the garden. That’s because there is not as much sunlight energy for photosynthesis. With all things considered, the lettuce did quite well in the hoop house before the Arctic Vortex hit. A few days later, after the temperatures finally moderated, I opened the door to peek inside. I’ll let you know what I found in my next post. This fall I put together a homemade hoop house, which is just another name for an unheated, temporary greenhouse. I’ve had small hoop tunnels in the past, just big enough for plants to grow but that’s all. This one is big enough to walk into. My new structure is allowing me to grow cold weather crops such as spinach, kale, and lettuce well into the winter. I also plan to use it to get an early start in the spring. This one I made from parts to an old shade canopy that I haven’t used for a few years. We used it during the summer months to keep the sun off the picnic tables when we had outdoor get togethers. Actually, I used only half of the pieces. Using all of the parts would have given me more square footage than I need. I just wanted a modest space to grow lettuce this winter. Looking at the pile of structural parts from the canopy I had in the barn, it occurred to me that I could re-configure them into the size of hoop house I was looking for. I did have to buy some materials for the project: plastic greenhouse covering, splicing tape, and pipe hardware. Since I didn’t want to cut any part of my shade canopy — in case I ever wanted to use it for that purpose again — I also bought one length of metal electrical conduit and four connectors to use as post extensions. Since the electrical parts were the same diameter as the parts I already had, it made it easy to splice the old and new parts together. I also added some thin pieces of wood to make a door and give a place for me to attach the plastic sheeting. I used 4×4’s for the foundation. I ended up with a greenhouse measuring 10 ft by 10 ft, that’s 100 square feet of growing space. Next year, if I feel the need, I can expand it up to its original size of 10 by 20 feet. Even the wooden parts to my hoop house are made from re-cycled material. If you’ve ever considered a hoop house or greenhouse, this may be an inexpensive way to get started on a small scale. And what if you don’t have a shade canopy of your own to recycle? Well, I’ve seen used shade canopies for sale at yard sales. Some of them had their shade cloth or other parts missing. That’s OK though since the parts will probably be re-assembled in a different configuration like I did with mine. So far, my hoop house is standing up to the wind and winter storms we’ve had. I’m optimistic that it’ll still be standing come spring-time. I went out to the garden the other day to check out the beds that were planted last fall. We had planted three beds, one bed of a leaf lettuce mix, one of spinach, and one bed of Bibb lettuce. The Bibb lettuce had a heat coil buried to keep the soil warm. I fully expected that bed to be alive, and it was. What surprised me was discovering that the other two beds were alive as well. They had nothing more than a plastic covering to protect them from the winter cold. It got down to at least -19F at this garden location. It was the snow cover that we had this winter that made the difference! Under a foot of snow that was piled on top of the bed covers, the lettuce and spinach were still alive and waiting for a little warmer weather to start growing again. You may want to think about making your own bed cover to get an early crop of lettuce this spring. A bed cover placed over a garden bed can start to warm the soil. You can start some lettuce plants inside then gradually let them get used to the cooler outside temperatures. Put them in a bright yet cool location (40’s to 50’s) for several days, then move them into your outdoor covered bed to get a real early crop of lettuce. Keep in mind that your lettuce that you grow in that bed will be better than anything you will find in the store. Check the prices at “Whole Foods” or some other high quality produce department to get an idea of what you might have to pay for lettuce that only begins to approach the quality you will be harvesting! Once your bed cover is made, you can use it next fall to extend the growing season.